The plans are simple, pack up three days worth of warm/cold/wet weather gear including multiple rods, reels, tackle, and more food than a group of men should eat in a long weekend, head into Pennsylvania to meet up with my friend Jim B., Floatman, and his long time friends, Dan & John and get serious about small trout fishing for three days. Our accommodations are very nice and aren't the easiest to secure, but since this has been a yearly tradition/ritual for Jim, Dan, & John for more than 15 years, the reservations are made well in advance. The state park log cabin is nestled under old growth pine trees and beside a small mountain stream lined with mountain laurel that constantly plays a medley that can make drifting off to sleep an unpredictable and pleasant surprise to even the most rested soul. Directly across the dirt entrance road is a bath house/latrine equipped with running water and flushing utilities. The hot showers after refreshing and a welcome treat to bodies suffering the extreme toll of fishing and hiking gradient for the day. Cell coverage may be spotty, but if you stand atop a bench, angle your head slightly to one side and point your phone North/North East, you may be able to get enough of a signal to make a call into the wife & kids to let them know all is well and you miss them too. Starting five days ago, the shenanigans began via email. The customary "count down" and then short quips typed from fingers that itched to be tying improved clinch knots on the next go-to fly rather than pushing pens at work. The anticipation was building, the excitement from contemplation of the next trip and the good time to come was causing grown men to act like boys. This is what fishing and weekends with friends was all about. The mysterious ways it controls those captured by its spell are so varied. As we check and recheck out gear, our pack list, and the weather, I'm reminded that repetitious preparation is for love of the sport, the power of friendship, and sharing it all as a group is what drives us. Speaking of weather. Floatman quoted a wise old Indian and stated the humorous, but obvious, fact, "There is a 100% chance of weather on this trip!" With this being only my second adventure with this group, it looks like it would be a repeat weather-wise of last year. I'm convinced that I've done something terribly offensive to Mother Nature, but I am thankful to have the faculties to experience the "bad" weather as much as the "good". I'm reminded that there are those that cannot with either end of the spectrum. I scurried from work toward my vehicle, fueled by a hurried excitement and filled with anticipation. My watch read 6:00:01PM and I wondered what the long weekend would deliver in terms of events? I went over the checklist. All of my essentials were packed and prepared, but a few last minute inclusions were still fresh in my mind. Loading the Xb up with all the gear had me wondering if I had over packed yet again. Better safe than sorry, I reminded myself. GPS, maps, pop, a small snack, and the cell charger found their spot within arm’s reach of my driving position. The sky was cloudy and the winds were switching between calm and howling. I had my fingers crossed. In between mountains, you never can be sure of what will actually transpire. The weather forecasts, taking the liberty to read more than one, were not as bright and cheery as my optimism or spirit. I convinced myself to remain content and enjoy the next few days regardless of the outcome. Three nights and just about three days of fishing and camaraderie were just what I needed to unwind and recharge. The possibility of few blown streams wasn't going to spoil my attitude. The drive into PAOD-08 was slated to last only 3hrs10min and 190 miles per the detailed instructions downloaded and printed from the internet. However, a slight drizzle had begun and it appeared by the darkening sky and purple/black clouds that I was driving into what would be the heart of a storm system. As the turnpike changed states, the rains intensified and the pace of my speedometer was retarded. I wanted to make it there as quickly as possible, but the need to get to Trout Camp safely superseded the duration of time it was going to take given the conditions I was battling. As I whipped through winding roads, varying gradients, and a blur of orange/yellow cautioned lined construction zones, I caught myself gripping the steering wheel with such intensity as if it had done something wrong and it needed a good neck wringing. White knuckle driving would surely keep me awake as the sun began to fade into absence, but would it keep me alive I wondered? I glanced briefly at my co-pilot. Wilson looked calm and collected, flashing that big smile that makes him legendary. I felt inspired. His deliberate display of happiness was all I needed to remain focused. As the falling rain hitting the highway increased and hydroplaning became a real crash threat, I noticed, for however brief a moment, the beauty of the situation. Water spray and charging rains formed what appeared to be an illuminated veil over top the East bound lanes of traffic. The headlights from the oncoming vehicles, especially the big rigs, had the rain in a glowing white state. The rain launched by heavy tires and speeding traffic suspended just long enough to be charged by headlights. The wraithlike strikes of thunderbolts above distant mountains produced an otherworldly feel to my otherwise “nail biter” drive. I thought to myself how great it was going to be to finally pull up to the cabin. The journey just begun and already I had experienced enough. I peered down at my watch and was relieved to find that by my calculations, it wouldn’t be long until I was on the last leg of the trip. Each mountain range and valley, at times, has their own micro-climate. What one area experiences in terms of temperature and rainfall can be completely isolated from another range only a few miles in any direction. Such was the case with this storm system. As I parked the D-box and exited, I felt the dry, cool breeze seasoned with the smells of a burning fire, aged wood, green moss, and leaves left from the previous fall. The soothing sounds of the babbling stream just outside the cabin grounds immediately calmed my nerves and let me know I was home! Walking the few steps up to the cabin, I was greeted by John, Dan, and my close friend Jim. 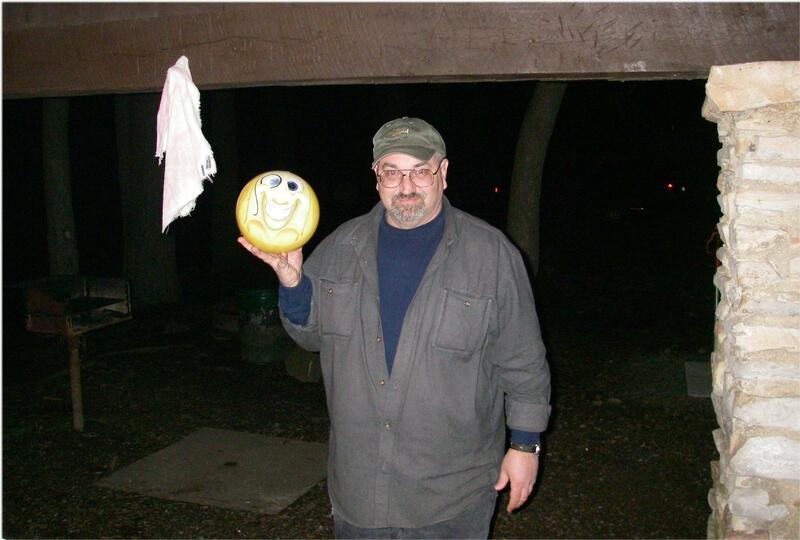 They had seen to it that the moment I arrived I felt completely welcomed to Trout Camp. My vehicle was quickly unloaded, Wilson found his perch inside the dining area, and I was presented with an ice cold beverage of choice. “Ahhhhh!” I exclaimed as I took my first long swig of the area’s finest. I quickly remembered that my wife had packed us plenty of fine food for both the meal and snack departments. I dug through the cooler and presented the group with garlic avocado shrimp dip. It didn’t last long and I can’t say it was an unexpected result! This was a great start. In a short period of time, my nerves were calmed and the laughs and tall stories were mounting into piles that hypothetically could have been moved about with only the largest of shovels. I smiled and reminded myself that the trout was the instigator of many of my close friendships, the facilitator of generous sharing, and the ultimate reason for me experiencing this good food and drink. I cannot count the many good memories I have as a result of fishing! It can be, at times, difficult to express how truly thankful I am for an obsession that has rewarded me time and time again. In short, I felt blessed once more. The evening drew on and gratefully the decision to sleep was announced. Our plans for the following morning were made long before I arrived. The repetitious routine chiseled into the granite of time for over 20 years could not be manipulated. The participants may have been a little more worn and a little more deliberate in their expediencies, but the excitement was as intense as if this had been the first year out. I could easily relate to their feelings as I shared them unconditionally. The excitement was evident by the behavior in our bunks. Like kids at camp, the giggles and shenanigans were almost unstoppable, that is, until the sandman grabbed hold of us and we drifted off to dreamland. Rising bright and early at the crack of dawn, the group made the trip to the Opening Day Hole, appropriately named for the fact that this location was the same spot fished year after year on the first day of this region’s open trout season. During the ride in, I could only hope that the water was in good shape. From 1:30-3AM the thunderstorm and rain had laid a swathe of wetness through the valley. How much actually fell was a mystery, but the fact remained…it was causing me to harbor a small amount of anxiety. As we clipped the last buckle attached to gear and ventured down to the locations we knew would reward our efforts, I found the water to be flowing with near perfect clarity and color, holding a green hue that was almost neon and a flow that had a pace easily fishable. The sight of this was an absolute Godsend. What did the weather forecasters know? NOTHING! We were sitting pretty as we shared the run with fewer anglers than year’s past and with conditions that were awesome. I believe they were convinced that conditions would be much worse and therefore, decided to sleep in? Whatever the reason, the ability to centre-pin and trot the run I selected was inhibited most of the morning. At 8:01AM the fishing began and on the first cast for most of us it was “fish on!” The early morning was cool, slightly overcast, and had that feeling of threatening rain, but thankfully it never fell. As they day wore on, we had periods of sun and clouds, warm temperatures, slightly changing winds, but overall an absolute great day to fish. And fish we did and for what seemed hours! The bite went from light to slamming, from on to off, but all in all…many, many fish were brought to hand. I was privileged to land a mixed bag of browns, bows, and brooks. And I was also able to land and photograph a very large bow generously deposited in an attempt to keep anglers on their toes by Pennsylvania’s DNR. After I hooked my “pig” several other anglers were rewarded with their own. The smiles stretch from one face and down the short line to another. This was awesome fishing! The Spring Fed Float Rod III – Dan Craft Edition performed extremely well and handled the many drifts and battles with absolute class. I was able to fish a 3” HBE and it was a riot on the big fish and drifted perfectly for the area I had chosen. Eventually the morning changed to afternoon. Our empty stomachs reminded us that it was time to eat. We packed up our gear and headed back to Trout Camp for lunch with the plans to return and fish this area again. Our evening return to the Opening Day Hole was again fruitful. The sun was now positioned at a more severe angle in the horizon. The tree lined stream provided much need shade mixed with streaks of radiant warmed flows, an ideal habitat for agreeable trout. The group hooked into multiples of brooks, browns, and bows. I found an interesting seam between the fast water at the head of the pool and the slack water of a beach area on the inside of a bend. I waited patiently for the location to become unoccupied. Currently there were a few fisherman almost waist deep in the area I knew would hold fish. They grew tired of their lack of success and made exit. The few minutes it took for me to relocate from one side of the stream to the other was all the time the trout needed as well. My first drift through the exact area that only minutes before held 3 pairs of boots was swiftly taken down by a brown. The next four consecutive drifts held the same fate. One after one, trout were reeled to hand. My success was noticed by an angler south of my position and my solitude disrupted my intentional casts to my target position. I didn’t mind it much, I had done well and needed a break. This gentleman was more than welcome to try his luck. I peered over to Jim and it was evident that this day was drawing to a close. The drive back to Trout Camp was filled with statistical information of how we all did, where, when, and why. I believe we all looked forward to some warm food, some tunes of the radio, and refreshing beverages. I had volunteered, combined with the assistance of my wife, to prepare dinner for the group. Given John and Dan’s generosity of allowing me to join the “club”, I felt it was the least I could do. I got to work and prepared a meal fit for “Trout Kings”. After finishing courses that included homemade Italian wedding soup, garlic butter sautéed yellow squash and zucchini, Uncle Ben’s wild long grain rice, and beer, cornmeal, flour battered, bacon fried trout…. Kings we indeed were! 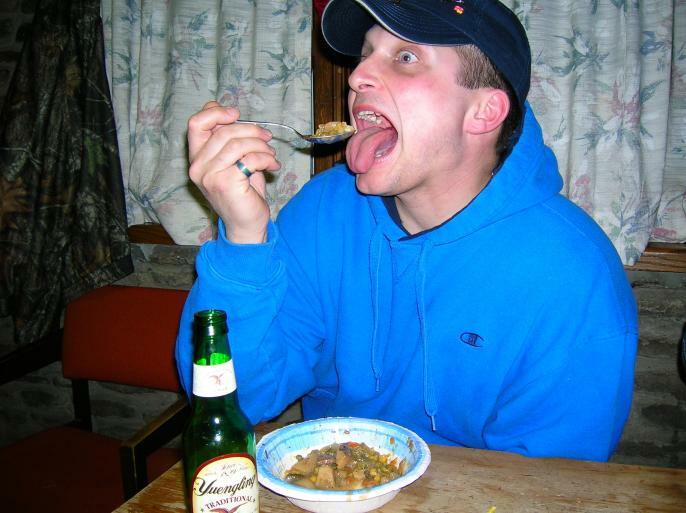 My efforts were rewarded with John’s comment, “Wow, I was really impressed by this meal. Thank you!” That was all I needed to hear! Although we stayed up late and aggressively participated in a group effort toward reducing the stockpile of ice cold beverages, I chalked day one up, at this point, as an overwhelming success! Within a 24 hour period of time, the temperature of day one had been reduced from mid-60’s to low 40’s. The intermittent breeze made it feel colder. It was drizzling and at random intervals we received doses of light hail as a reminder that nature likes to mix it up at times. Our destination further down the interstate contained some great pocket water fishing. The gradient the stream followed was more severe, rocks more slippery, and holes much deeper than our fishing trials the day before. As were rounded the bend up the mountain, the area to stop was parked over with vehicles. An on the fly decision, at 50MPH, was made that concluded our first decision would not be exercised today. Jim’s words, “We’ve always got a plan B, C, D, and E” played in my head. These guys were dedicated fishermen and knew the area well. There were always areas to fish and our driver was intent on getting us to one of them. We drove down to another location just above a bridge that began a delayed harvest area. From the end of the DHFF area and upstream, the underwater structure was elusive. High atop the treelined banks, it appeared that the stream was nothing but a slow, flat, meandering run…void of any real obstructions that were obvious trout holds. I can’t say I like water like this. Casting blindly and hoping for the best is not my idea of fun fishing. I tend to want to pick the stream apart and target high probability areas and I’m willing to take a walk if I can’t. It was evident, that reading water was a must as most of the underwater structure and fish holds weren’t as cut and dry as my preference would have them. Jim and I began fishing a few seams that were bountiful the year before and neither of us experienced any real excitement. Due to the amount of pressure the stream had received the day before, I can’t say we were surprised. Plugging away on a down log that extended out toward the middle as Jim continued to fish a deep run nearest my position, we both had take downs, but with little confirmed success. After 20 minutes and a few headshakers and long distance releases between us, we moved further upstream content to “work” this area for all it was worth. We knew there were fish to be had regardless of how many had been removed destined for freezers the day before. It boiled down to putting the time in, presenting the offering properly, and finding fish willing to succumb to the desire to feed. Leaving Jim to fish on his own, I ventured up toward Dan and Jim. They had a tendency, demonstrated the year before, to fish one particular hole that had some extreme depth combined with a nice gradual stream bend. Due to the length of the run, more than a few anglers could wet a line and keep free from the struggles of crossing lines. 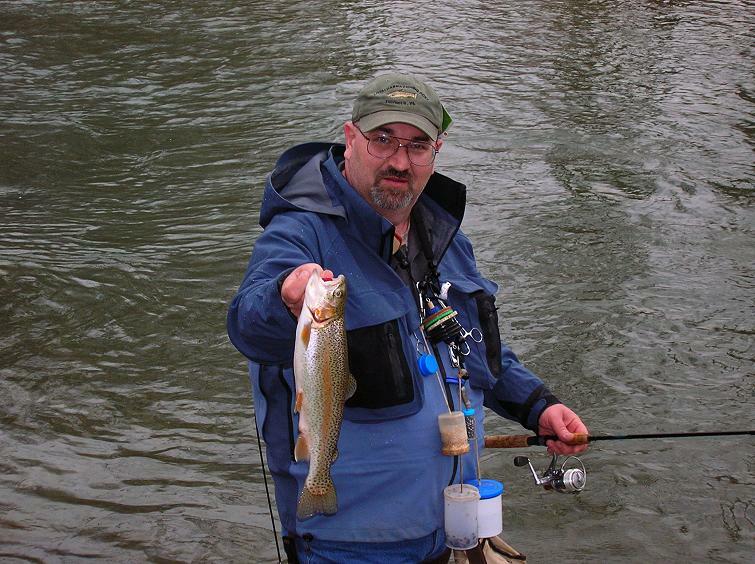 In spite of the ever changing weather conditions, the water remained clear and very fishable. The temperatures of the morning would swing what seemed 10 degrees depending on the cloud density smothering the sun’s rays. I wondered what effect this would have on the willingness of the trout to feed. I also wondered about the barometric pressure and its tendency to shut the bite down within seconds. 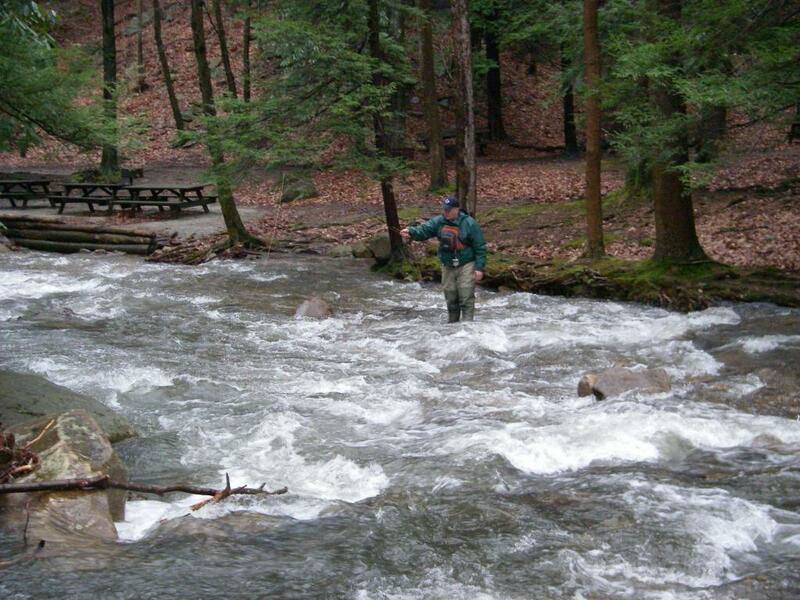 The rain had stopped, then started, then stopped….it felt like steelhead weather in Ohio! Nothing we couldn’t handle and to be honest, maybe it was for the better. Thankfully, as the time approached noon, the warming water was enough to activate the fish. I had made my way back to Jim’s position; he hadn’t ventured very far from where I left him, and crossed above to fish the faster flows. He was plugging away on a down tree that was preceded by a decent pool. The fish were now active and frequently breaking the water’s surface. This location was about to give forth its bounty and in abundance. Several drifts in, I had my first violent take down in the fast flows of the very head of the pool. No more than two seconds from the plop of the float in the water, it was under and shaking violently. I reeled back on the rod and worked the CL Eclipse reel for all it was worth. This was the first trout on the Lythe and it was a joy to fish. I also was amused that the fishing circumstances provided a decent small trout to be the first for this reel since I received it. Rightfully so, I thought. It was the start of a good afternoon of fishing. Jim was next up to have some fun. Watching his drift and his float cap, as often is the case when we’re paired up, I made the “Oh, Doh, Doah!” announcement at the same time he recognized “Fish On!” Shortly thereafter he brought a very nice bow to hand of what end up being a couple dozen fish from this one spot. Some noteworthy events had us in awe. Jim, while reeling in for the next cast, noticed a swirl and strike behind his float as it skimmed back to his spot. It was first thought a trout had maybe mistaken the float cap as some edible. Noticing this, Jim immediately pause his rig and then “whammo!” fish on. But something was different with this fish. 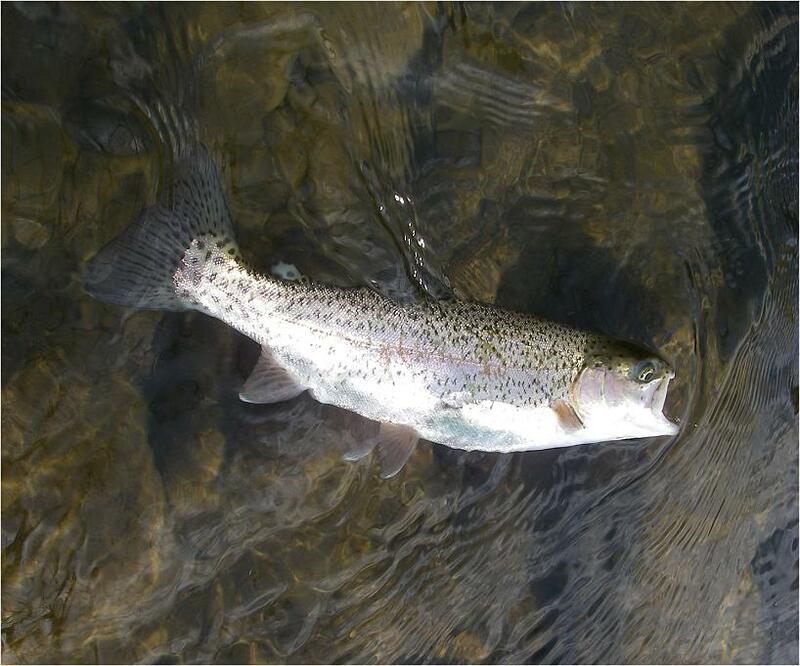 He immediately commented, “I don’t believe this is a trout”….and it wasn’t. Indeed, he had just caught a huge largemouth. Unusual? Yes! The largemouth was the icing on a morning that started extremely slow, but ended up being quite rewarding. Once again, our bellies reminded us it was time to eat and we ventured back to the cabin. After a quick nap, I awoke to find that the left over wedding soup, now combined with the left over rice and zucchini/squash mix, was piping hot. I made a couple sandwiches and had a few bowls of soup. That sure felt good. I was again ready to tackle the rigors of small trout centrepinning! LOL! As if it is that difficult!? Jim and I decided to venture down to a small DHFF only area and see if we could catch us a few late afternoon fish before the group would head to a local establishment for refreshments. The DHFF had several stream improvements sure to hold trout. I immediately took Jim to one such area. A high bank above a man made abutment of logs and gravel. The faster flows of the head whipped past the structure and dropped to at least 8 feet deep. From there and out a good 60 feet the stream bed slowly ascended to a little under 2 feet deep. This was an excellent location for two pinners to setup camp and get some serious drifts. Jim was the first to hook up. We were floating tandem rigs made up of nymphs. I believe his success was on either a red san juan worm or a bead head caddis. A few more hook ups on his end and a few “maybe hookups” on mine and this beautiful area looked to be a little stale. The maggot containers, power bait, and other trash littering the immediate area hinted to the possibility of poaching. Maybe this was the reason that the success we expected wasn’t what was being delivered? We ventured upstream and Jim noticed a deep hole that was littered with downed logs and tree branches. 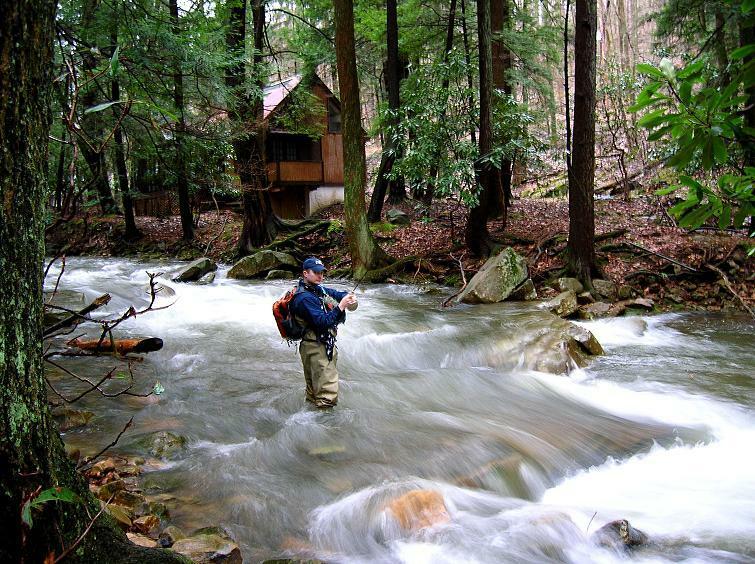 A true trout haven if floated delicately enough to avoid snagging up on every drift. I set my depth more shallow than the highest submerged log and watched Jim pick this hold apart. He experienced many hookups and quite a few landings. After a bit, he generously allowed me to take command of the swim and within minutes I had a nice bow with beefy shoulders to hand. We scored a few more fish and then called it another good day of fishing. Jim and I hurried back to the Jeep knowing that John and Dan would be ready to head to the local establishment immediately on our return. The following morning we made a late start and ventured back to the location overpowered the morning before. Thankfully as we approached the parking lot the lack of vehicles meant we would make the stop. This stretch had much more current due to the decent it took toward the valley below. Huge boulders were strewn and white water pockets were abundant. The morning sun was uninhibited and shown brightly across water that was gin clear. 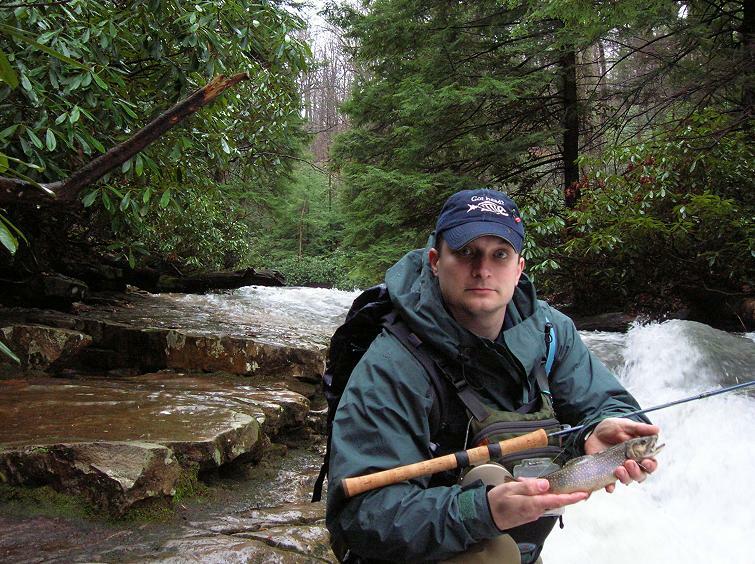 We were blessed with pocket water and deep pools that provided enough structure that the trout were willing to hit regardless of the fact that they could see us and our efforts without issue. I studied the raging water as I was determined to cross. The rocks were covered with a brown slim that made navigating them very precarious. Extreme caution needed to be used to prevent a plunge into some very cold water. I had taken a warm shower at the cabin early that morning, the last thing I needed at this point was to take a cold bath! LOL! I selected the best route and with a heavy stick in hand for stability I began the crossing. The water’s current reminded me of the Clarion River. As I walked calf deep, my footing was at a severe disadvantage. Halfway across the river a large boulder provided a much needed resting point and place to strategize the other half of my journey. I found it hard to think as the raging water surrounding me was filling my head with a loud roar. Perhaps a warning, or likely a cry from a river that I was about to tame! I made it across and hurried down the bank determined to perch myself atop a high rock shelf that would allow me to drift a great distance with very little interference. 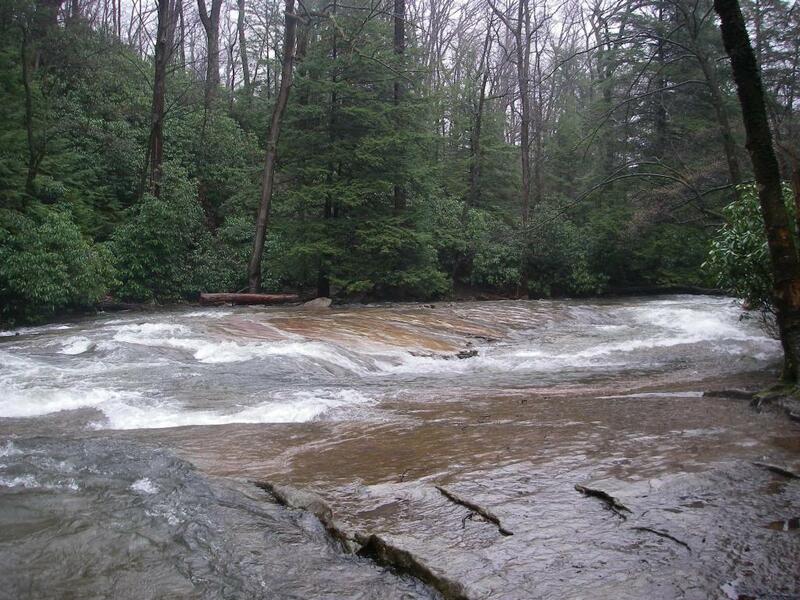 Several drifts among swirling currents and down to a deep swimming hole and it was fish on. A little guy that fought harder than his size due to the strength of the current he swam with. At this point, the need to explore a few more areas had me on the move upstream. I had noticed an old bridge abutment that was decayed to the point that most of its mid stream structure was now current breaks and possible trout territory. I ventured up and found the best position at the head of the run amongst the very fast water. This spot would allow me to trot down into at least 4 current seams that I was sure held trout. And hold trout they did! I worked from nearest seam out in an effort to maximize my returns. The first seam that flowed from the fast water at my feet, only a few inches deep, into a pool 6 foot deep that ran alongside a huge boulder gave up three bows. Working the fast turbulent water of the start of the previous drifts I braked my reel hard to deliver the offering to just in front of the “V” created by the boulder’s head. This delivered 2 more fish. Then working the far edge of the same run I trotted out and away as it drifted down stream and picked up several more. The water was cold and those caught in the faster currents hit hard and fought harder. Finding the two best sticks I could and having them pass the stress test, I prepared to demonstrate the fastest river crossing they had every witnessed. I squinted across the river and plotted my course. Leaning slightly forward and gripping the sticks in a way that make me four legged. I trotted across the river. Slamming the sticks down into crevices in the stone and wedging them between current and rock face, I kept my pace deliberate and hurried. In less than a few minutes I was tossing them along the opposite bank and climbing a 60 degree hill to the audience above. I looked up and saw a few cracked smiles and shaking heads. Yep, mission accomplished!